Continuing my not-terribly-regular series of sifting through my long list of bookmarked tutorials, and passing them along to you. Continuing my effort to pass my list of “some day I’ll make that” tutorials off to all of you. 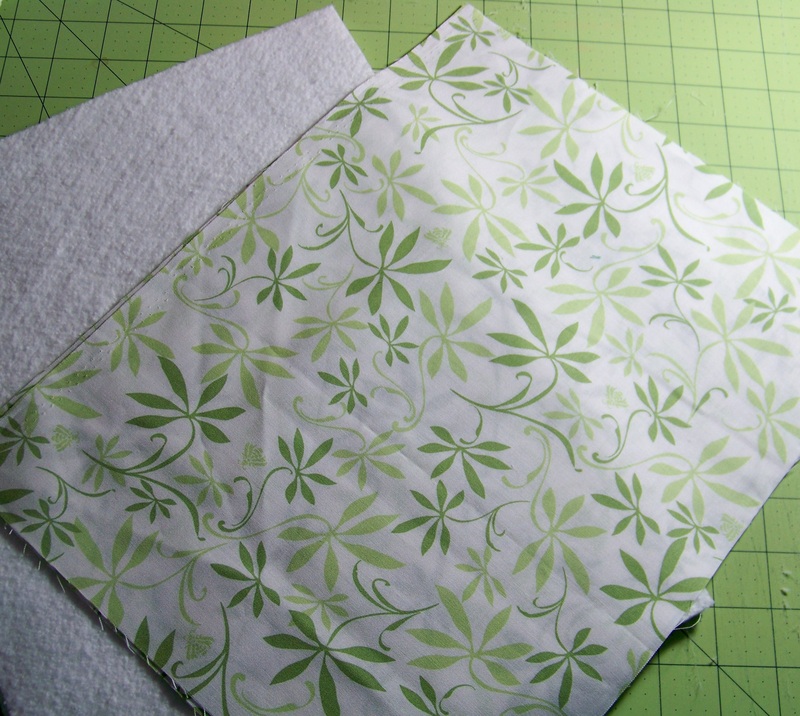 I use cloth napkins: they feel so civilized, and green, and I haven’t had to buy paper ones in years. I have a more than sufficient supply, but that doesn’t stop me from accumulating designs for more, and for napkin rings to go around them. Happy crafting – and eating! 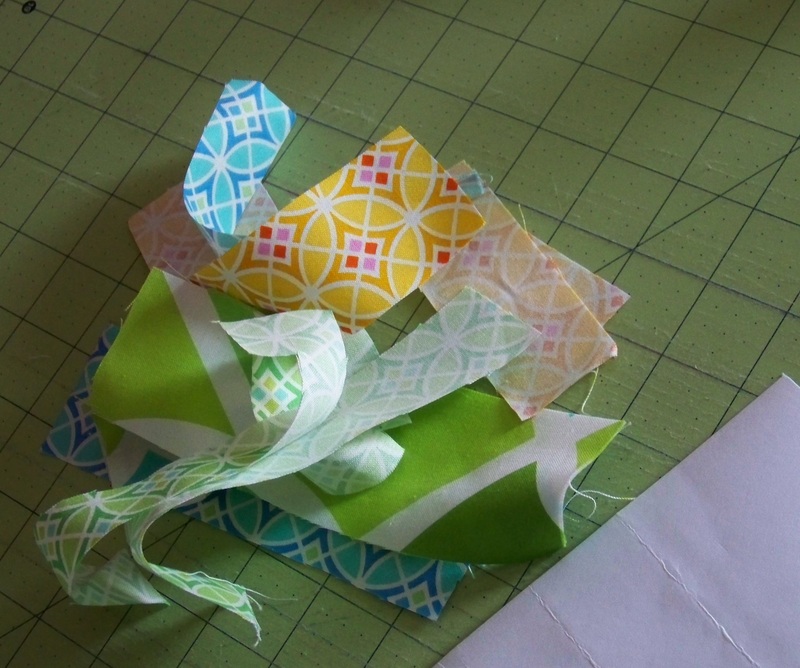 I don’t know about you, but I collect tutorials for projects I might do someday almost as fast as I collect fabric, which is to say, much faster than I can actually sew them. If you’ve got good tutorials languishing on your “someday I’ll make that list”, link to them in the comments, so I can add them to mine. I made two sets of these, and the pictures are a mix, I hope the changing colors aren’t confusing. 1) Pick a foundation: I’m using a 5×7 piece of paper. Usually for paper piecing, you’re planning to tear this off, so I look for really lightweight paper (I put the phonebooks that show up on my doorstep to use). However, I’m leaving the foundation on for these cards, for a bit more stability, so tearability is less important even detrimental. Instead, think about acid-free materials. 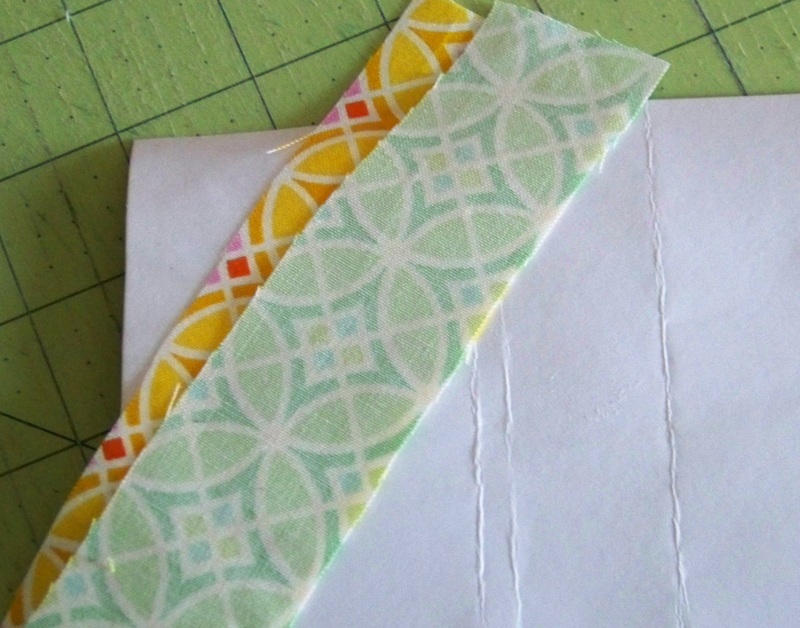 You can use whatever you like, but if you’re planning to save your card (or have their recipients save them) remember that paper like newspaper has lots of acid in it that makes it degrade, and that will eventually effect your fabric too. All of the scrapbooking/papercrafting supplies at the craft store should be acid free. About size – you can use whatever size you find pleasing. 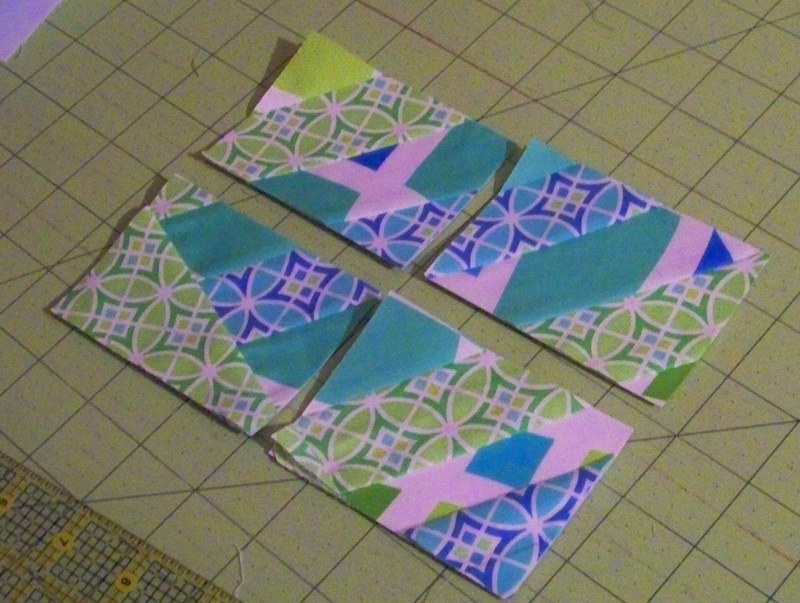 I’m going to cut my square into quarters, ending up with 2.5 x 3.5 inch pieces. That’s the size of an ACEO, and just a pleasing proportion. 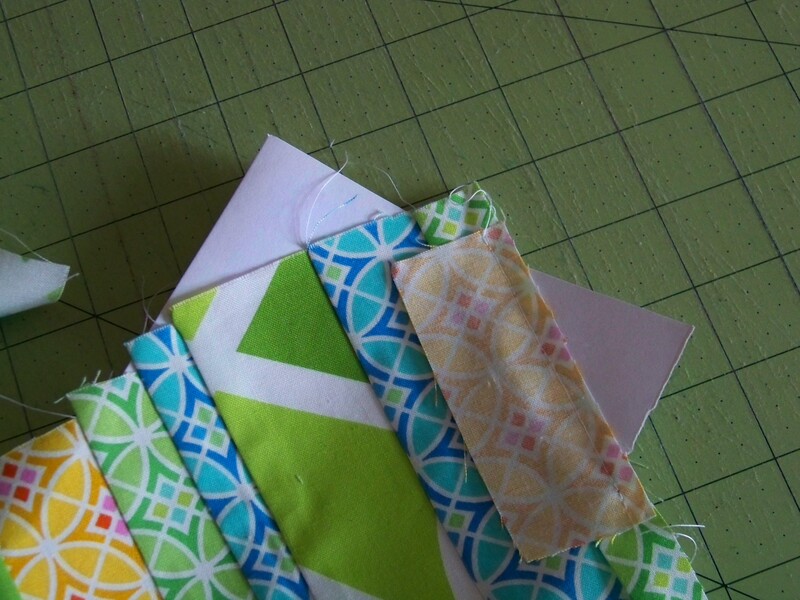 2) Decide on your pattern and fabric. 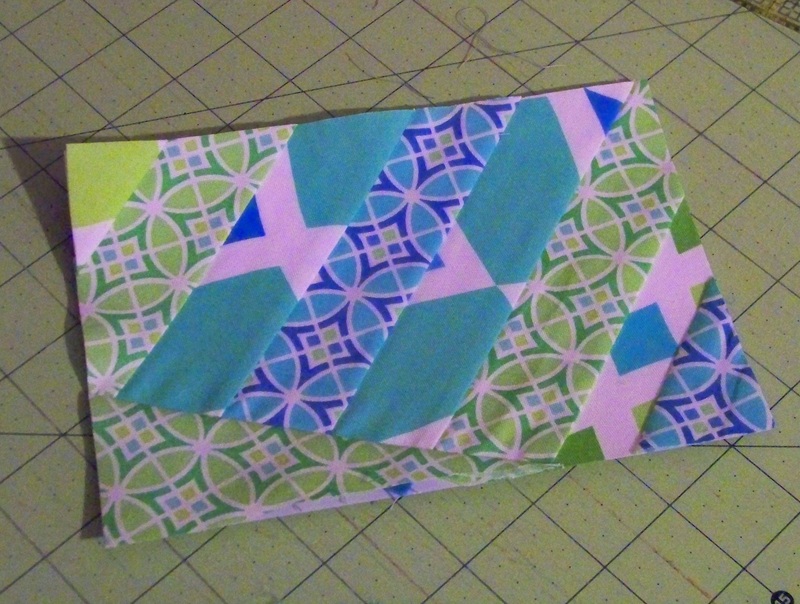 You can use any paper piecing pattern you like, but I really like the look of a sort of improvised string-block. 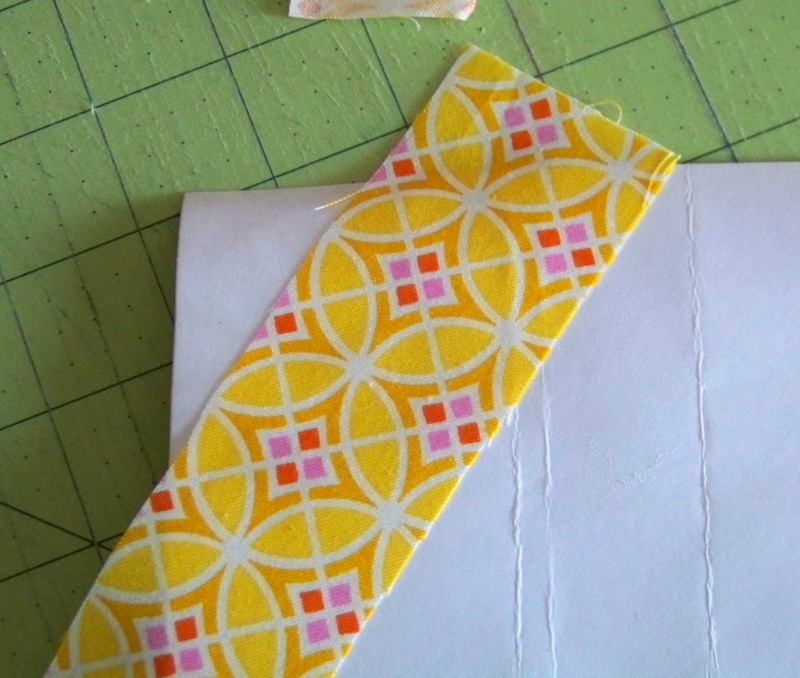 So I’m just gathering strips of different lengths and widths in coordinating colors/fabrics. Film in the Fridge has a nice tutorial for string blocks that you can use. I use a fabric glue stick to secure my first piece of fabric (right side up) at a random angle across my paper foundation. Line another strip up along one edge, stitch, flip, finger press, repeat. For this particular card set, I added a strip on another angle across the top. 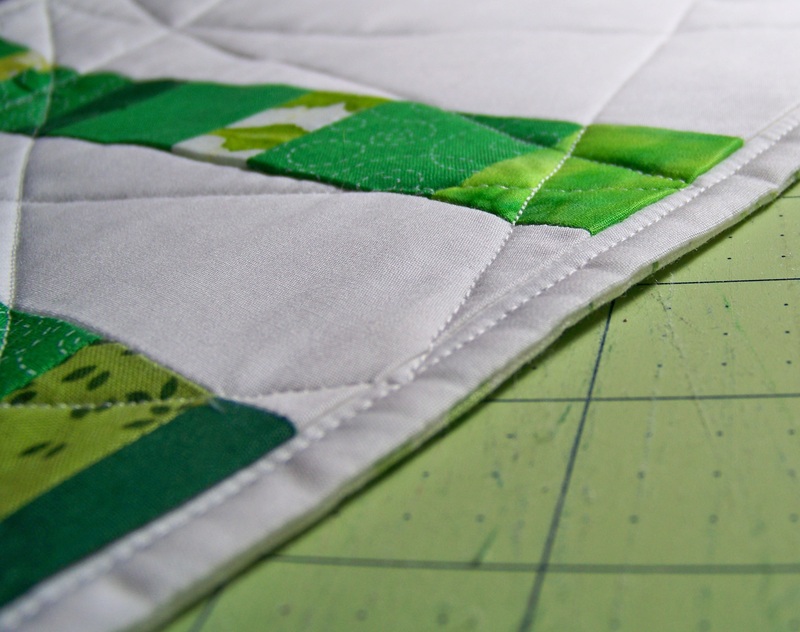 One important change from regular paper piecing: don’t reduce your stitch length. 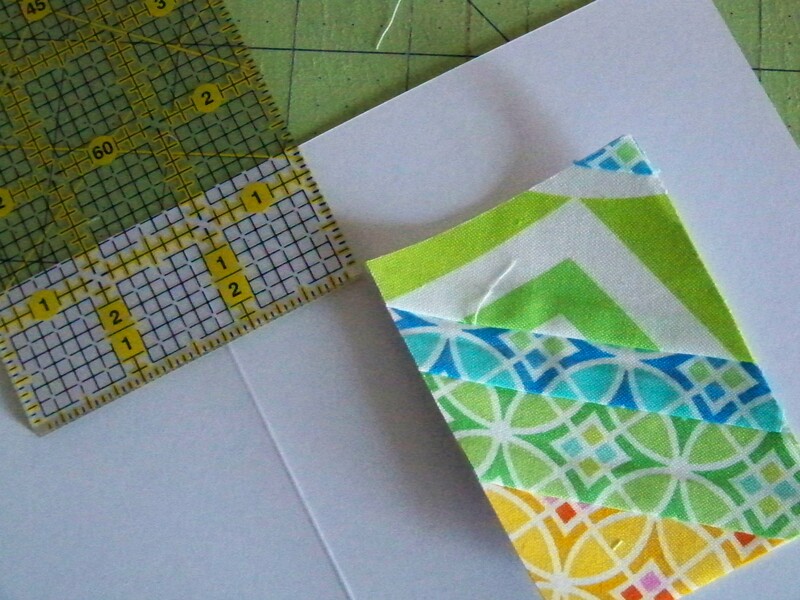 A smaller stitch perforates your foundation paper, the better to tear it off, but I’m not planning to do that. 4) When you’ve covered your whole foundation paper, use your rotary cutter to carefully trim away the piecing that hang over the edges. 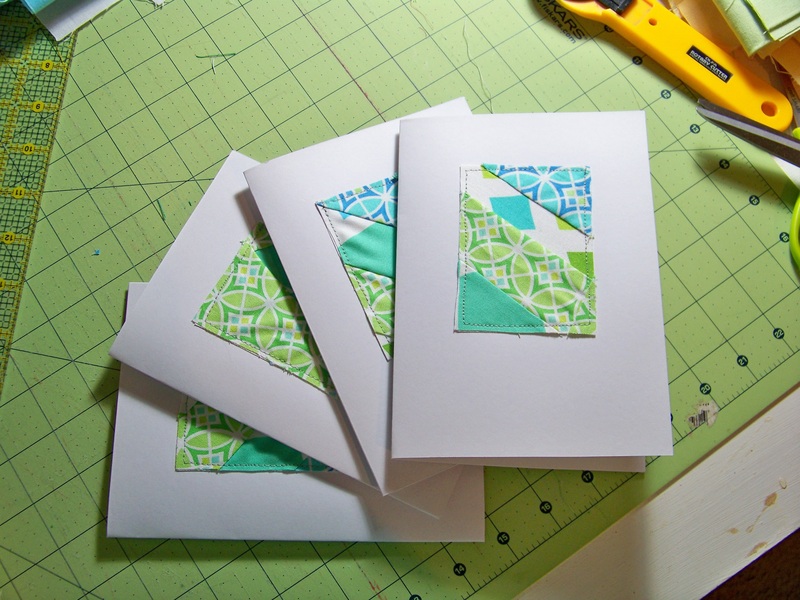 5) Cut your block – my 5×7 inch block is getting cut into four quarters, so I cut up the middle vertically, then horizontally. But again, do what you like – you could cut bigger or smaller pieces. 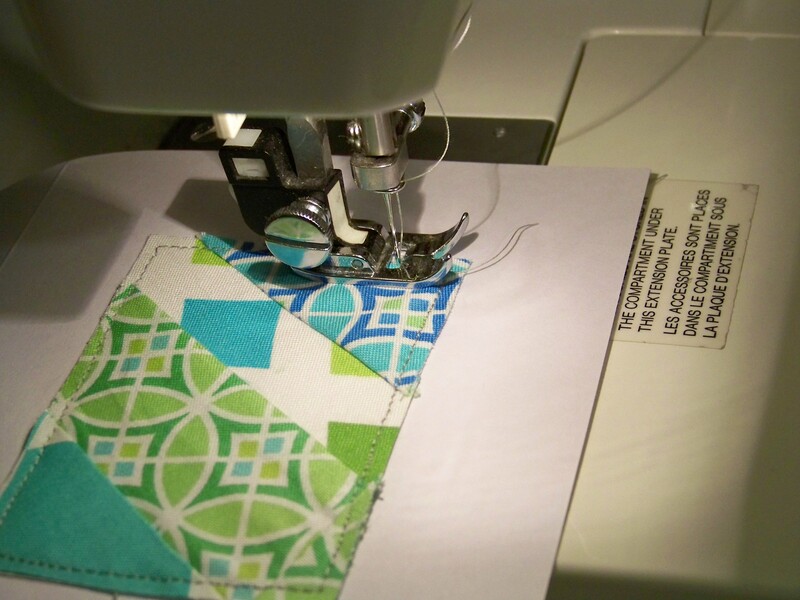 And while I like the efficiency and randomness of the piecing you get by doing it this way, you could skip this step altogether and just size your foundation the finished piece you want. 6) Place block on cards. 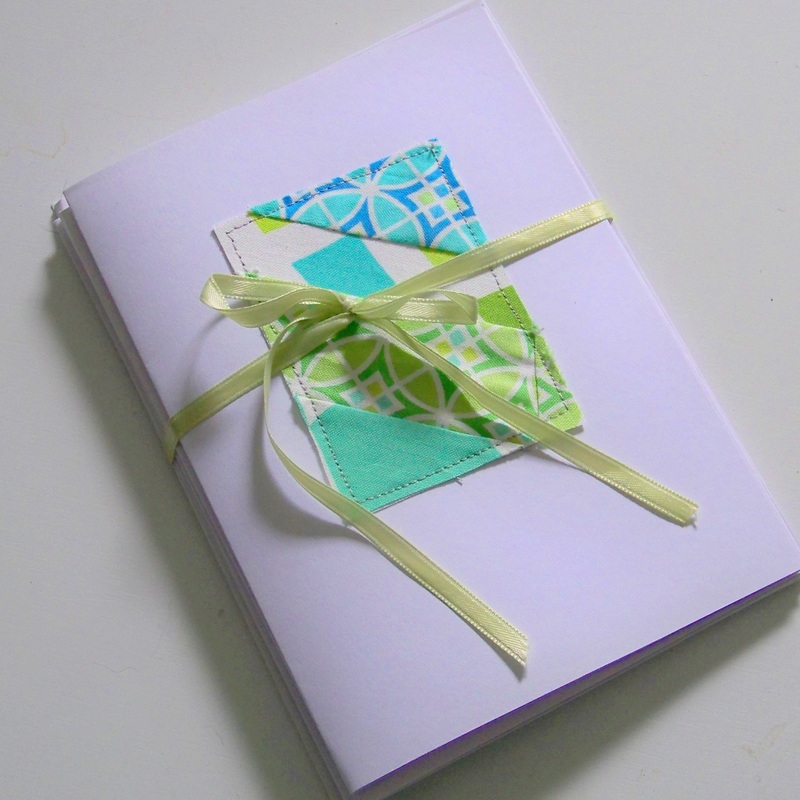 I use white 5×7 cardstock cards. I got a pack of 50 or 100 of these (with envelopes) ages ago at a craft store, but you could also fold your own from cardstock of your choice. I like to position the fabric so that it’s centered horizontally, but is higher than centered vertically. Play around to see what looks right to you. If you want to match mine, the top right corner is 1 1/4 inch down from the top edge, and 1 1/4 (the same distance) in from the right edge. 7) Stitch. To secure the fabric to the card base, we’re going to top stitch around the edge. Pay attention to your fabric – you’ve probably got bias edges all over the place, even with the foundation still on for stability. Both top and bobbin thread will be visible, so think about how they’ll look. I’m using a soft gray, but you could either match it, or pick something contrasting to add interest. No pins, they leave holes, you can use another swipe of glue-stick to hold it temporarily in place. I stitch about 1/8 of an inch from the edge, all the way around, use a fairly long stitch (My machine goes from 0 to 4, I’m at about 3 to 3.5 for this) . Secure your ends with a small backstitch or two. 8) Done! Well, I’m done, you can keep going if you like. I’m making blank cards. You can embellish further if you like — add a message on the front or inside, or decorate with rubber stamps, paper, pens/markers whatever makes you happy. 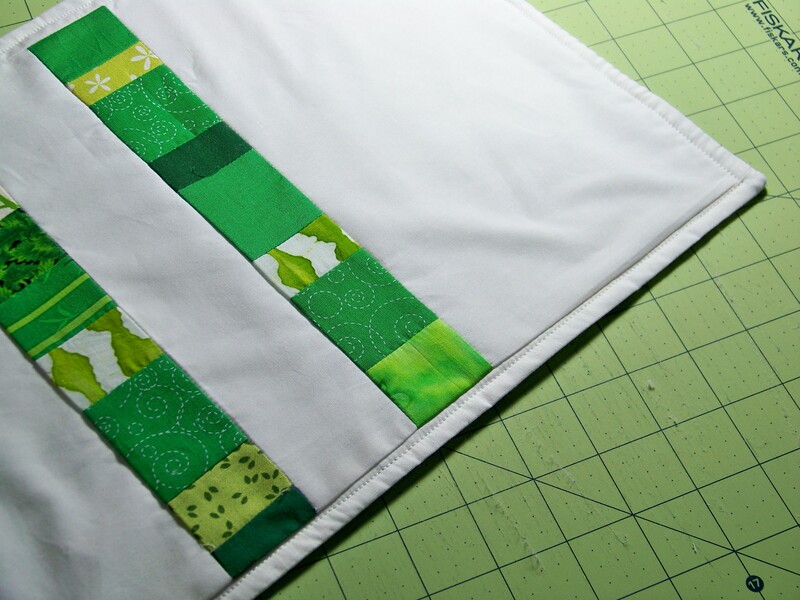 If you’re planning elaborate embellishments, you may want to do them before you stitch the fabric on. Tie a set with a piece of pretty ribbon, rick-rack or a strip of fabric for a gift, or stash them at your desk for a pretty note. Someone asked for a tutorial for how I finish my placemats. This is basically the birthing method – so it’s definitely not original, or new, but it does make a nice placemat. 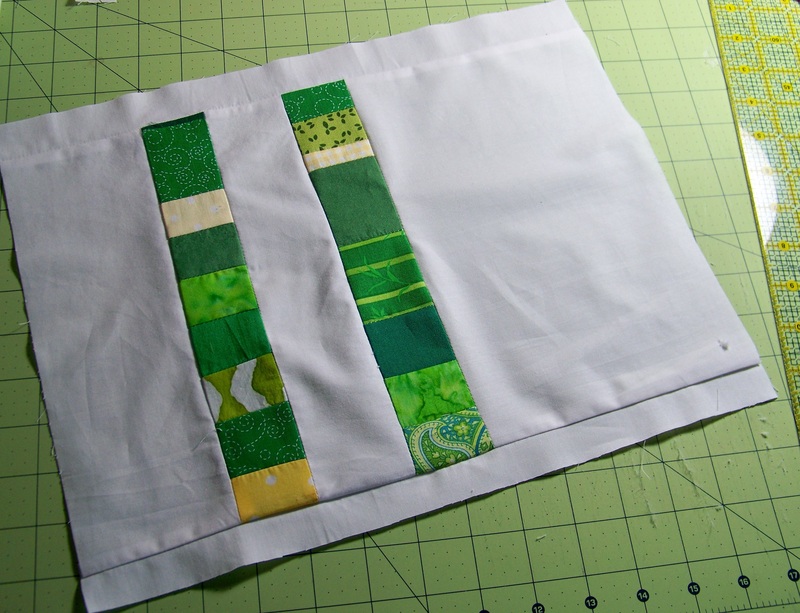 1) Make the fronts of your placemats – you can use a single solid fabric, or use patchwork or applique, whatever you like. 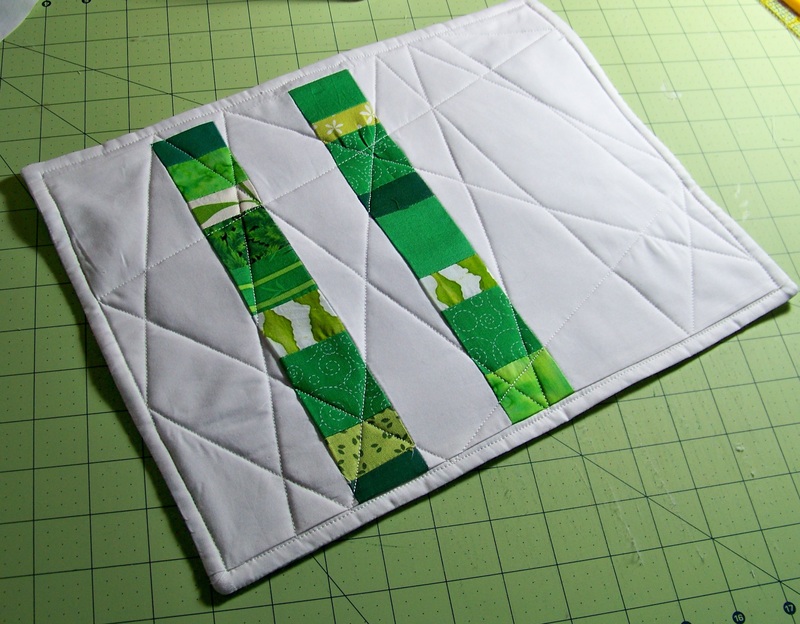 It’s a great way to use up scraps or orphan blocks.I’ve used one of my favorite designs, a couple strips of patchwork on a white background. The size is up to you – my sample here is on the small side at 11×14. Keep in mind that you’re going to lose a quarter inch seam allowance on each side. 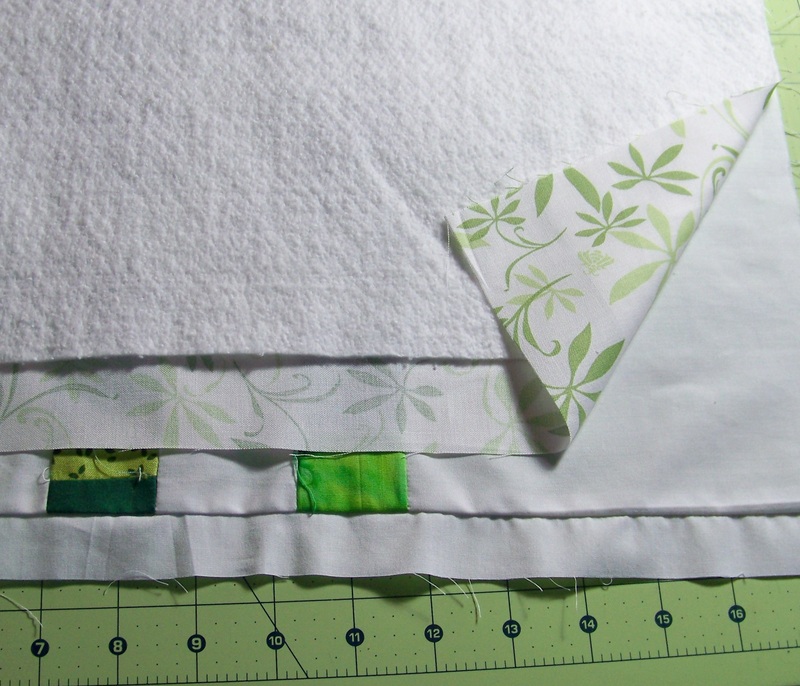 2) For each placemat, cut a backing and piece of batting the same size as your fronts. You, of course, are going to layer them with the edges neatly lined up. 4) Stitch most of the way around, leaving a gap large enough for your hand to fit through easily. A walking foot helps – if you’re not using one, just be extra careful that things don’t shift. 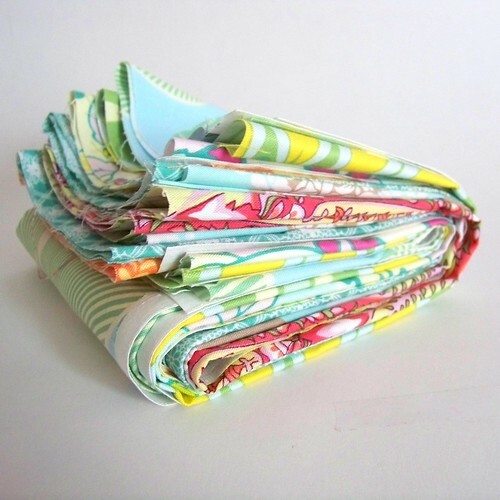 Whatever foot you use, keep an even, quarter inch seam allowance. You can use pins to mark your opening, like the picture, but I don’t usually bother. If I have a choice, I do try to keep the opening away from patchwork seams, so I don’t put stress on them when I’m turning it. 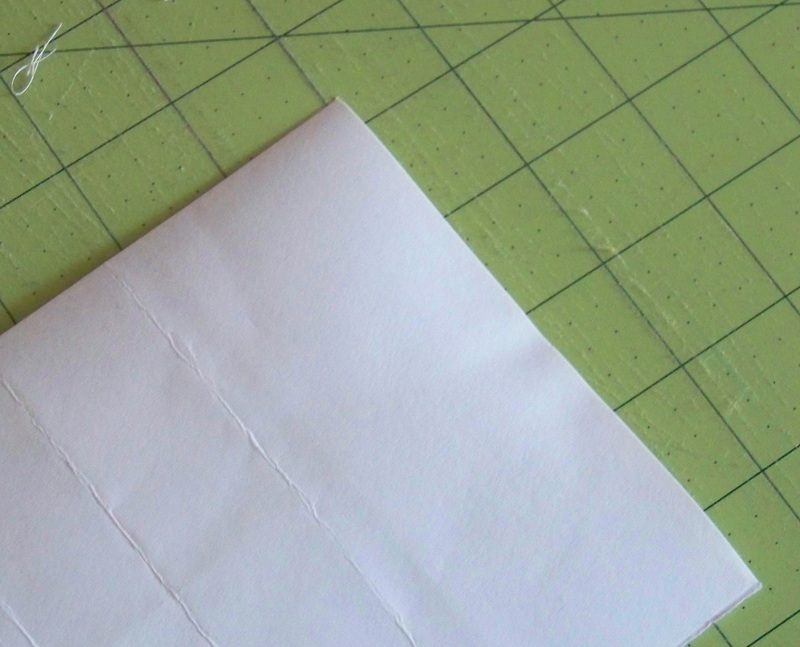 5) Trim the corners to reduce bulk. 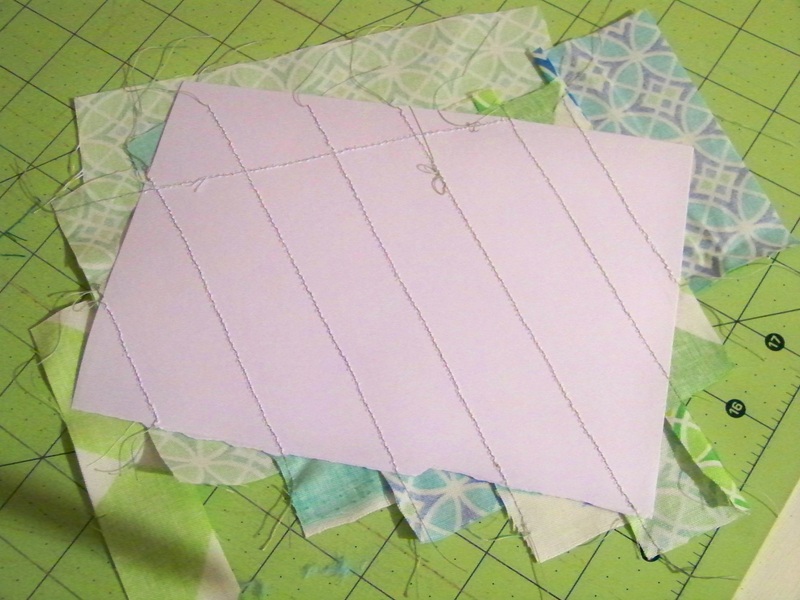 Cut the tip of each corner on a 45 degree angle leaving yourself about an 1/8th of an inch seam allowance to the corner. 6) Turn your placemat. I don’t have a picture here, really, there’s no way to take a picture of this that doesn’t just look like a ball of fabric, and I’m sure you can figure it out. Poke the corners out – I like to use the blunt end of a bamboo skewer, but use whatever, just be careful. 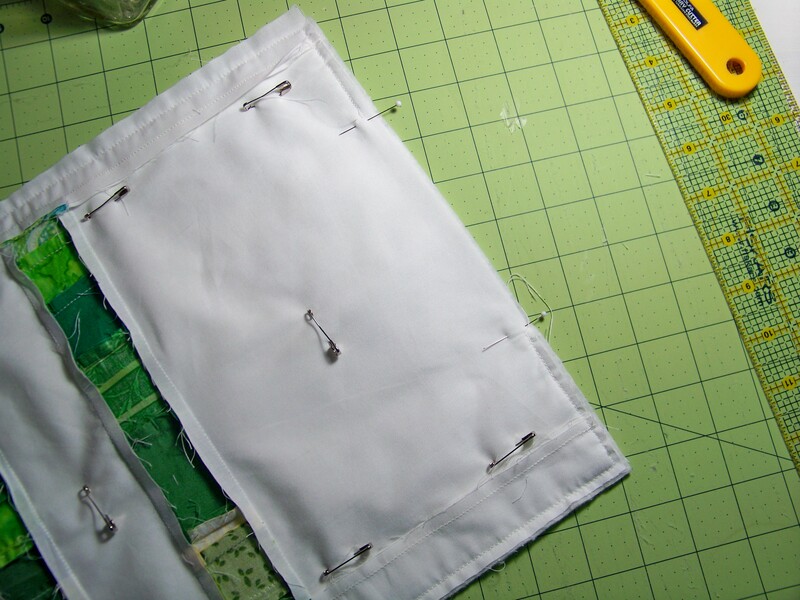 7 ) Press – paying careful attention to the seams. 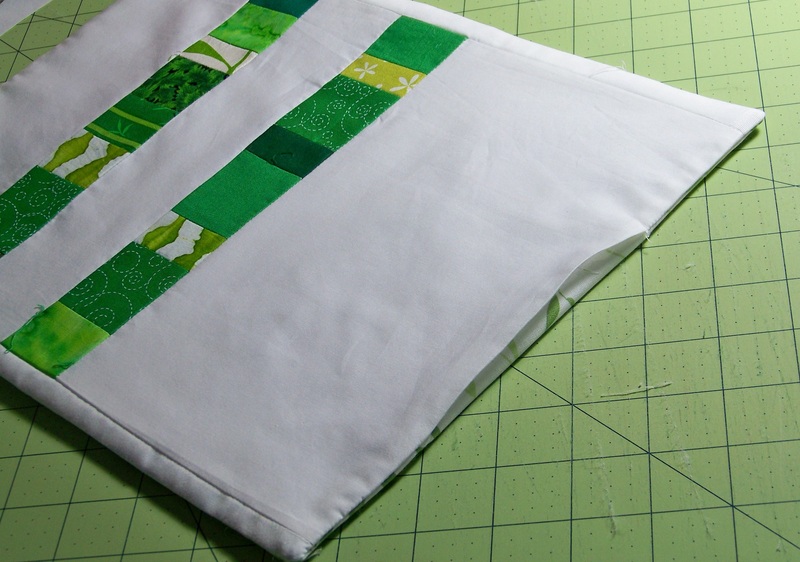 You want them to lie flat and for the backing and front to make a nice even like. I iron the opening too, I think it makes it easier to stitch it up. 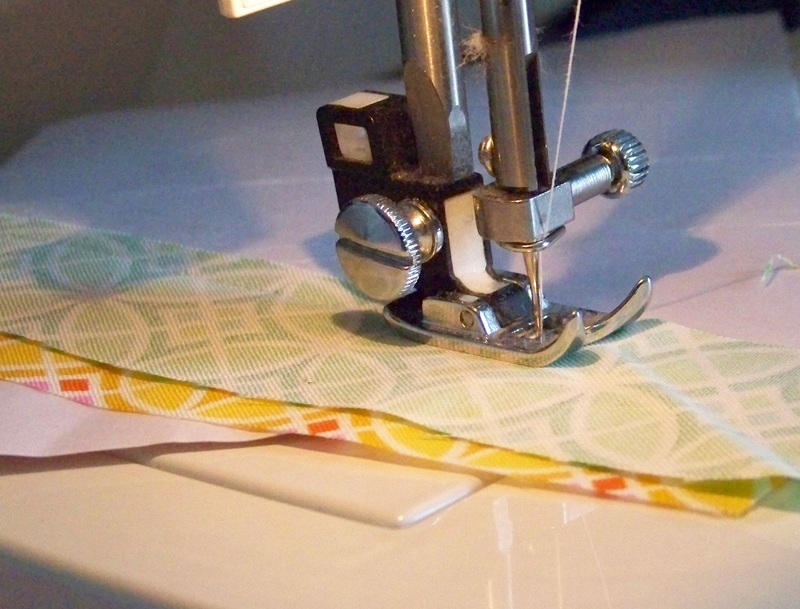 9) Top stitch around the edge of your placemat. 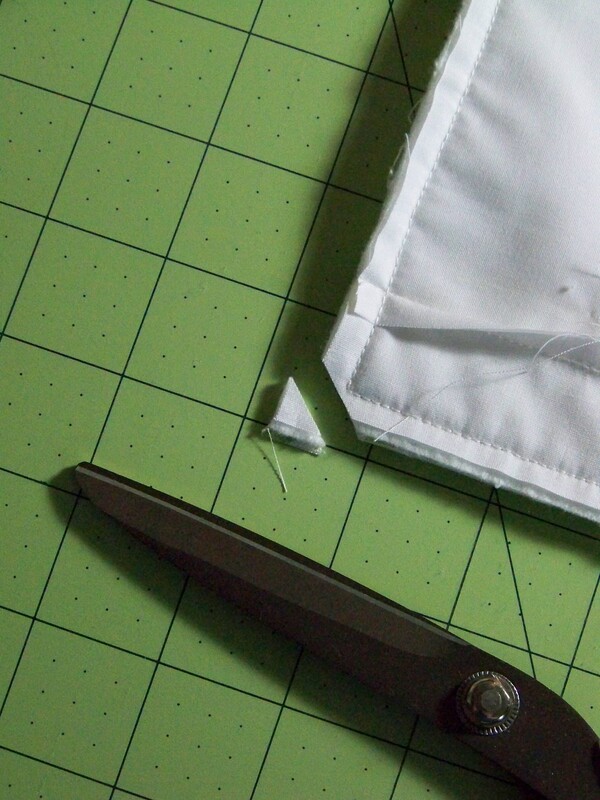 This helps keep the folded seam in place and gives you a nice edge. 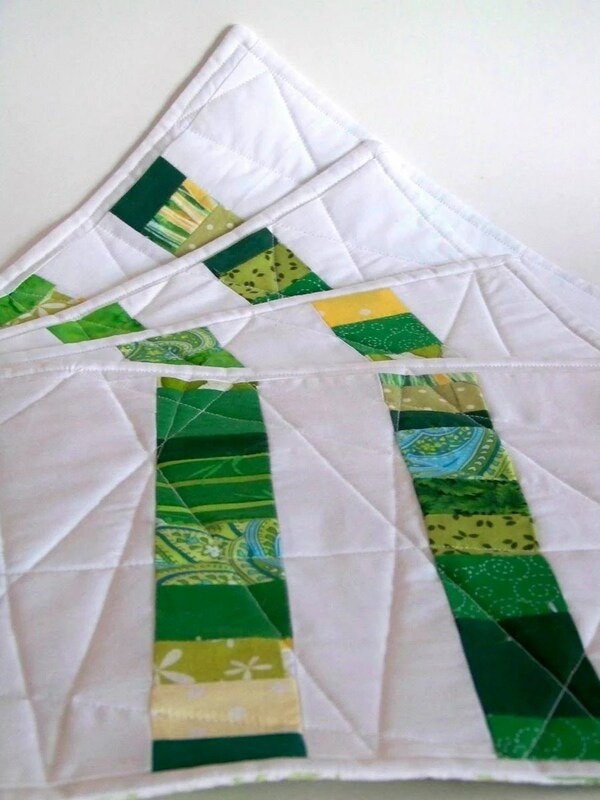 10) Quilt using the technique of your choice – I used machine-quilted straight, random lines, but you could do free motion or handquilting just as easily.